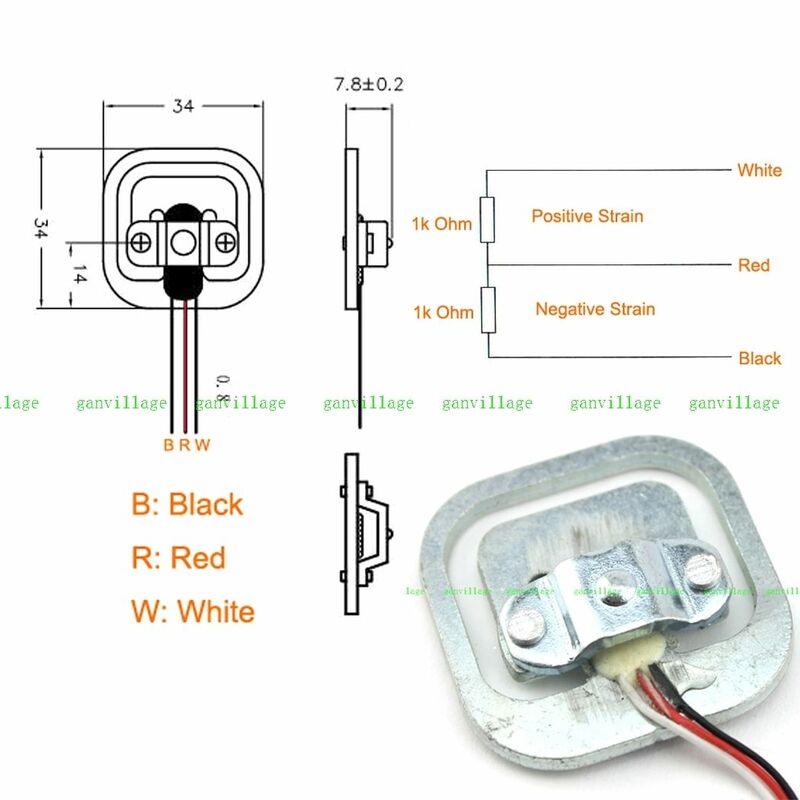 I am involved with a 4H project looking to take some weight measurements with bee hives and am trying to figure out some 3-wire load sensors to do just that. I have four 3-wire sensors (load sensors/strain gauges) from one bathroom scale (each sensor was at a corner). Each sensor has a red, black and white wire. The resistance between the red wire and either the black or white wire is 1k ohms. The resistance between the white and black wires is 2k ohms (the resistance between the leads on my load cells and each came away with R->B=1K, R->W=1K, B->W=2k). Because of this, I was told each 3-wire load sensor represents 1/2 of a Wheatstone bridge (each sensor containing two 1k resistance legs). I can get my head around the single wheatstone application but I'm confused how a scale would work when made from two wheatstone bridges. My question is, if this is so, why would a scale require two Wheatstone bridges (remember, all four 3-wire sensors came from one bathroom scale)? The strain gauge elements come with a positively stress-sensitive portion and a negatively stress-sensitive portion. If you wire them up carefully by flipping them around so the stress sensitive portions unbalance the bridge constructively, you can use all four sensors without any extra resistors. 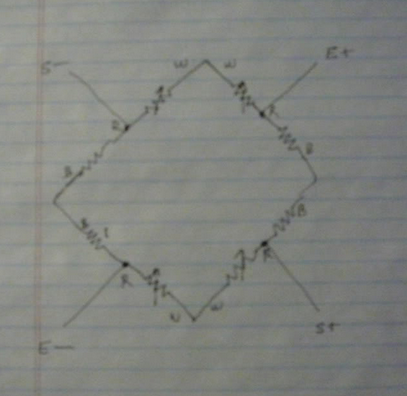 jonk's link to the blog post at http://www.nerdkits.com/forum/thread/900/ has a good hint with Mongo's diagram (copied below), and the jonk - user37977 comments on jonk's answer also help. Basically, two diagonally-opposite sides of a wheatstone bridge are formed by the positive-strain elements of two gauges wired in series, while the other two sides of the bridge are formed from the two negative-strain elements. With compression on all the positive-strain sensors, the active resistances are reduced, and it pulls the bridge out of balance one way, and under tension, the positive-strain resistances increase, pulling the bridge out of balance the other way. Wire all four sensors in a big ring with maximum resistance, matching colors and initially ignoring the center tap wires. Choose two opposite center taps as E+ and E-, and the remaining two center taps as S+,S-. Put the excitation voltage on the E+/E- from the diagram above and read a force-sensitive voltage difference across S+/S-. See https://electronics.stackexchange.com/a/75717/30711 for a good schematic and Arduino Leonardo + 3 wire Load Cells + INA125P – Analog Signal Bounce / Noise for a wiring diagram of the colored wires combining into a wheatstone bridge. ... which indicates a positive strain gauge on the red-white, and a negative strain on the red-black. (note that the coloring order in this diagram does not match the coloring order in this picture. I have a similar gauge with blue-red-black colors, and the positive strain gauge is the right pair, negative on the left.) The gauged surface on the center bar between the face-to-face coupled 'E's in the sensor should act like a parallel bar and has portions under compression and under tension, rather than purely under tension. In cross-section, the gauged bar in the center is sort of the cross-piece in a Z-shaped spring. In this case, the strains oppose each other, and, if manufactured well, the reduction of resistance in the negative strain portion will offset the increase in resistance in the positive strain portion and the total white-black resistance should be constant. One still needs to set up the bridge so that the voltage dividers move in opposite directions with added load, and 4 devices wired in a white-to-white and black-to-black loop should work as above. 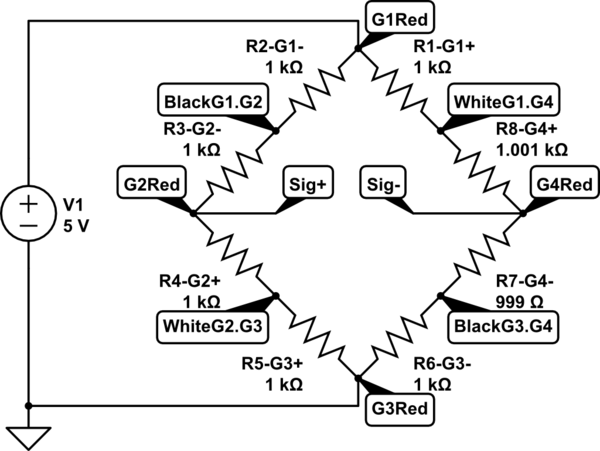 With only two devices, one should hook white-to-black and black-to white, imposing an excitation voltage from between these two junctions, and reading the differences across the reds, as increased load pulls one side high and the other side low. If all the half-bridge sensors changed their resistance exactly the same when a load was applied, can you see that they could be mounted in parallel - the effective end-to-end resistance would drop from 2 kohm to 1 kohm but that is of no consequence to a bridge measurement circuit. Even if there are disparities in the resistance between two paralleled devices then I'd bet on the error introduced being insignificant. Maybe they used two wheatstone bridges and two differential amplifiers and summed the signals internally to get an average but I doubt it because cost would be an issue to them. Why couldn't they use two half-bridges and two dummy load cells? It's probably cheaper and more accurate to use four half-bridges. I think Omega may discuss a possible explanation and schematic. Four strain gages are used to obtain maximum sensitivity and temperature compensation. Two of the gauges are usually in tension, and two in compression, and are wired with compensation adjustments as shown in Figure 7-2 (ed: see below.) When weight is applied, the strain changes the electrical resistance of the gauges in proportion to the load. I also found a blog from 2010 that may help, too. How you make these work is make each strain guage into a full wheatstone bridge by using fixed 1k resistors to make up the other half. This way the scales take the weight on each of the four corners and adds them up to give the total weight on the plate. Not the answer you're looking for? Browse other questions tagged load-cell wheatstone-bridge or ask your own question. 4 cell bath scale to Arduino what is circuit?